"How many horrors have they summoned?" Mormu, Xol Spawn is a Major Hive Wizard, who appears as a mini boss in The Summoning Pits Strike. 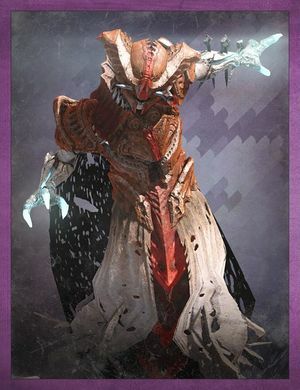 She and her coven are responsible for conducting rituals upon the Hive's Ogres including the creation of Phogoth, the Untamed. Mormu spawns in The Gatehouse after two of the three Hive Runes have been decoded by a Guardians Ghost. Guardians must kill her in order for the final rune to be unlocked. In the remastered version of The Summoning Pits, The Abomination Heist, she is replaced by Umra, Xol Spawn.